I guess we should have expected this with the early heat we received this spring. This is usually the beginning of the stretch of weather that creates the most significant issues for our staff and our aged greens. Usually, the Invitational had just concluded and it appears the gates of hell begin to open due to the heat and humidity we experience over the next few weeks. Turf is stressed to its limits trying to get speed, growth has ceased and damage begins. It is my hope that we took some preventative steps this season and at the beginning of the heat wave in late June that has given our greens a fighting chance to make it through these terrible conditions. What is hard to believe, the worst is still possibly to come! I guess a few statistics first. Right now we are about a half a degree above the all-time record average temperature for the month of July. 87.6 is the record and we are at 88.2. I think this will probably climb with our 100's this week. 10 days in a row of 100 degree days in a row is 2nd all-time. At the course, we have had 2.05" of rain since May 7th. We have surpassed our total city water usage from all of last season and we still have 2 fairly dry months to go in August and September. We are on track for the hottest year on record, at least through the first 7 months. Enough of that horror story. It appears the permanent use of solid rollers on our greens mowers is paying off. We began this program last season and have continued this year. The solid rollers place even pressure across the roller creating less stress on the greens. The swag or wiehle roller has grooves on it that presses down on the grass forcing it to stand upright and get cut tighter. Solid rollers can create slower ball roll due to grass plants laying over but this is offset with grooming, verticutting, brushing and regular topdressing. I think for a few weeks in June, the greens were rolling more consistent and with better roll out than I have seen since I had been here so we have taken care of that issue. Right now our ball roll is not real quick but we are doing everything we can to create a stress less environment for our greens. Greens are being mowed one day and rolled the next. Light amounts of regulator are being utilized to reduce top growth and force energy into the root systems. The regulator also reduces the total amount of energy needed for plants which are producing very little energy right now because of the high heat. With the high soil temperatures, it is remarkable that our greens are growing but the staff is getting plenty of grass when they mow. Light amounts of fertilization are being used as well as seaweed extracts, fish emulsion and other plant stress reducing products. Our fungicide program is using the best and updated products to prevent both surface and subsurface diseases from getting a foothold on our greens. We will lightly topdress during the next break in the weather which assists in ball roll and protects the crowns of the plants and mixes with the thatch created by the plants. We raised the height of our greens cut from .120" to .125" in late June and have not lowered them. I felt the extended heat we experienced in early July was just the beginning and it was. We did what we could to get speed for the Invitational but death would be all over us right now if I had not made adjustments to our program until after the Invitational. I'm considering another raise in the height but at this time will keep things the way they are now set. We are managing our greens watering a little differently this season than in years past. The desert like temperatures and lack of moisture have forced us to water even heavier than I planned but overall I think the program is working well. We are attempting to keep the profile consistently moist which will allow for water to move through the profile more quickly if needed. Normally, flushing heavy rainfall helps to recharge the green root system and can create a firmer surface after a couple of days of draining down. Lack of rainfall has forced us to keep a consistent level of moisture down in the 3-4" area of our root zone to prevent rapid turf loss. I believe some of our turf loss last season was in an effort to keep the greens too firm and fast during a time that was too severe in temperature and lacking moisture. Healthy greens were allowed to dry down too much creating root injury and ultimately loss of plants on the green surface. We have purchased a Field Scout TDR 300 soil moisture meter which helps us determine the moisture % at a 3" depth of our greens. This meter should help us keep our moisture levels more consistent with less wild swings in moisture levels. No guessing or feeling the sand to decide if there is enough moisture or not. We test at least 15 areas or more of each green on a daily basis and or as time allows to determine the level of moisture in our greens. It will take a few weeks to get some base line readings but we are already beginning to see some trends of the % they need to be to stay healthy, especially during this severe heat. We can dowlload the data from the meter onto a computer which helps us with our data collection. More on this during another post. Two hydrojectings have assisted with water infiltration and or drying on the surface. A needle tine operation is planned in the middle of August which should take us through the month of September. Our staff and I are out on a regular basis hand watering greens, showering and cooling and monitoring our surfaces. We are doing okay so far but know we have a long way to go. Rest assured that we will do everything we can to get our greens through this rough stretch of weather so we can get into September and have great greens rolling smooth with extended ball roll. Greens 2, 3, 11 to the south and greens 5,6,8 and 9 to the north are tucked into areas of the course that do not receive adequate air movement during this time of year. Air blowing at speeds of less than 4-5 mph over a green surface reduces the plants ability to ward off heat stress. Air movement across the surface forces the plants to open up their stomates on the leaf surface allowing water to evaporate out of the plant. The photosynthetic process and respiration function work somewhat normally even during high heat periods as long as there is strong enough air movement. The lack of air movement keeps the stomates closed which helps to build up temperature within a plant that can lead to cell damage from internal heat build up. In a way, a plant works like a human system that becomes heat stressed. Heat builds up internally which can damage cells and or our organs. 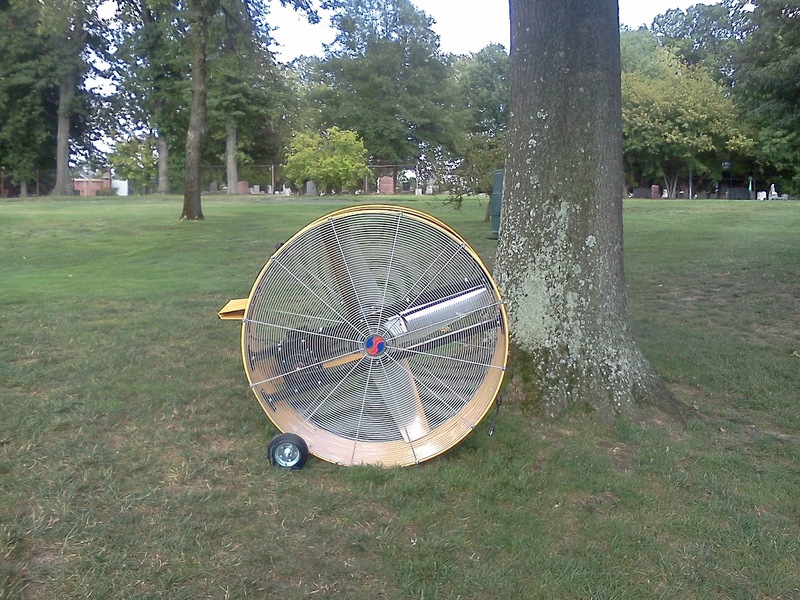 We've purchased a 48" fan that we will rotate around our greens on the south side and will utilize the electric from the old water fountain at 11 green/12 tee. We are modifying a driving range fan that we will be putting on a trailer and using a generator for the north greens, especially 5,6, and 8. There will be some noise from the generator that I hope you can manage through while putting but I think the noise will not be as bad for you if our green conditions stay good. The fans will also work to dry the surface during high humidity periods which leads to disease development and less than ideal putting conditions. Our hope in the future is to install electricity along #6 that could potentially feed permanent fans along holes 5,6 and 8. The fans utilized on many courses today can run in the ballpark of $ 6,500 a hole, not including the electrical installation. We would have to run new service from the field bar for holes 11 and 3 and potentially service from the pumphouse for #2 and maybe #12 if we feel it necessary. I've seen the benefits of fans over the years at fellow superintendent's courses throughout the country. I was recently reading a posting on a web board by a superintendent that installed two new fans on his course on his two weakest greens that have now become two of his best greens. Air movement is an important component of healthy greens and hopefully we can improve in this area. A standing dead and a weakened tree were removed near the fence line along #3 late last week The staff have also been pruning red maples and other trees that are dangerous for operators to work around while they try to trim around the 1,000 or so trees we have on property. The work will also assist our members and guests who might end up underneath one of these trees so they can identify their golf ball and make an attempt at advancing it toward the hole. The staff have also been involved in the yearly pruning of the Amur maples that line the roadway along Lucas & Hunt Road. A new sidewalk and signs have been installed which required some additional lift of the trees so that road signs could be seen by motorists. There will be ongoing tree management work as time allows over the next month or two. 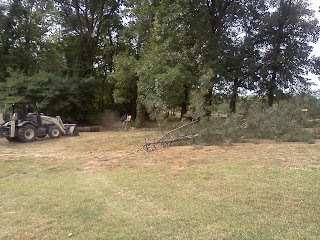 Cutting down the stump of the dead oak and preparing to cut up the pine that was dropped nearby. The staff completed the repairs to the underground spillway from #9 lake to the small lake on #10. 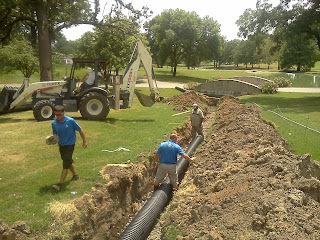 120' of double walled 12" pipe was put in place, an irrigation line had to be moved and the area was back filled. The area is full of bermuda grass so our plan is to fertilize it, water it and watch the bermuda fill in. I'm sure we will need to do some backfilling of soil when it begins to settle when the rain begins to fall again. Skip, Harry, Tom and Jason placing the pipe in the trench on Tuesday. 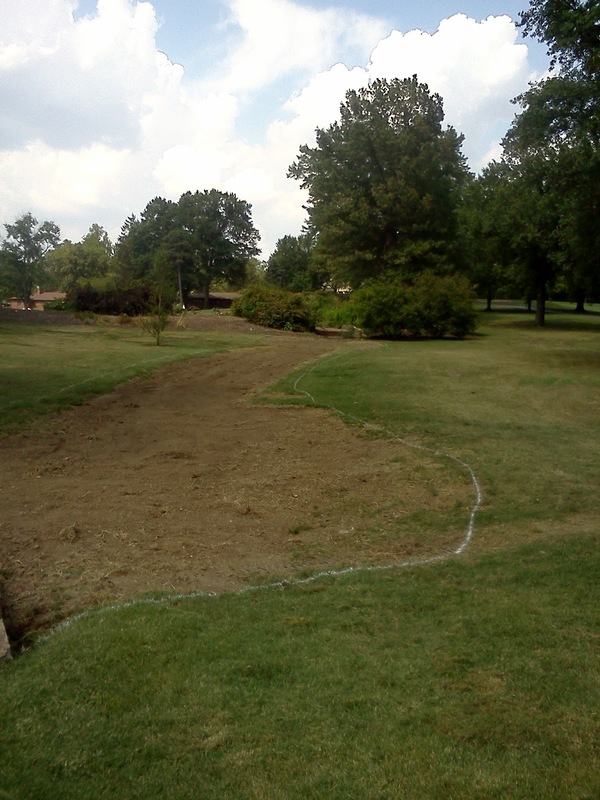 The line was backfilled and graded smooth. Skip and I and our 11 staff members who arrived before first light at 5 am to get the course ready for day one of The Invitational. What a great evening of activity around the 18th green and new Pierson Memorial Plaza. The mayor would have stood there with his hands on his hips marveling at the sight! Here's to great golf and fun over the next 2 days!!!!! Finishing touches are being made to the golf course. and facilities over the next few days for the Invitational and the rest of the golfing season. We had to rent a lift to prune some trees. 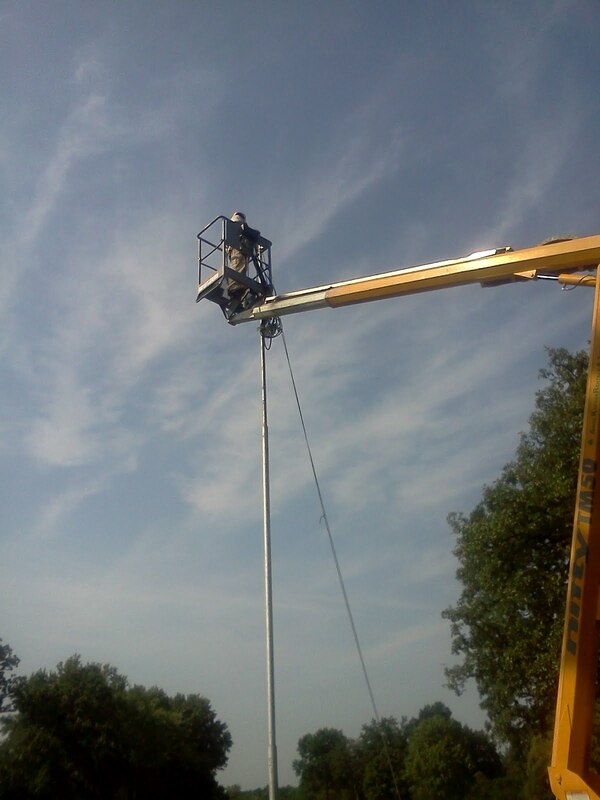 The flagpole was in desperate need of a new coat of paint and Skip is making it shine again. 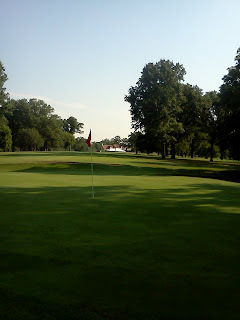 The greens survived the heat, now its back to mowing, rolling, and regulating to get some speed for the event. Almost 4/10" of rain last night. Course should play well this week. We look forward to a great event for you and your guests! ! 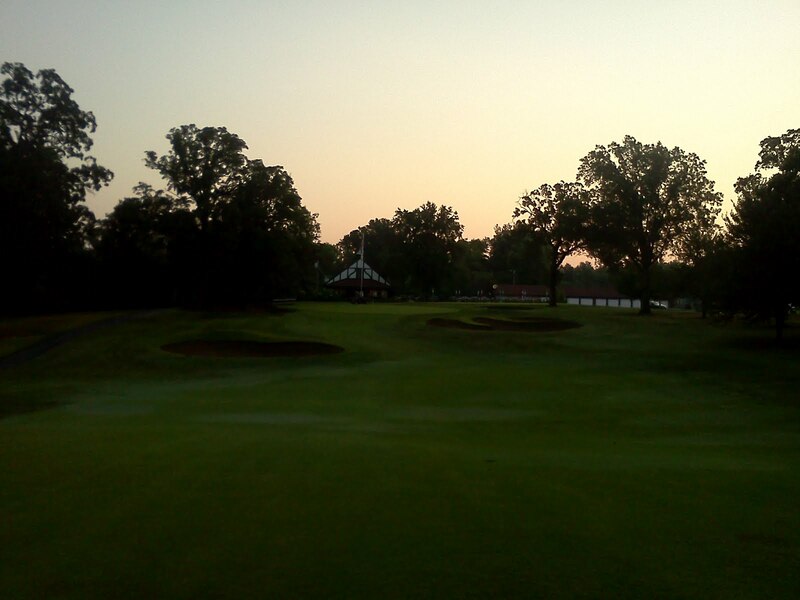 Four hours left in our preperations for the 2012 Invitational. We hope our members and guests have a great time! A delay has occurred in making our repairs to the #9 spillway. A fitting had to be manufactured to help us connect the old galvanized pipe to the new corrugated plastic pipe. We hope to have the fittings by Thursday or Friday and will get the line laid in place and hole covered up very quickly. I would expect everything to be back in place by early next week. I hope everyone has a great July 4th holiday. Might be extended for some who are off through the weekend. Yes, it is going to be really hot around the club the rest of the week but get our early and enjoy our conditions. We are holding our own right now and working hard to keep things nice for the upcoming Invitational and the rest of the golf season. Looks like a break is coming in the weather next week, at least out of the consecutive 100 degree range. Appears we will not quite reach the all-time record for consecutive days over 100 but 10 is enough for us. I believe Chef Rob has a couple of specials planned for this evening and a Pig Roast(Mmmmm pig) planned for Saturday for everyone to enjoy. Sign up on the website or call and place a reservation. As always, reservations help the staff plan for the members and guests who will be attending!. The pool should be rocking as well throughout the week. Betsy and staff will be working hard to providie a fun and safe experience. Horticulturist Becky's landscape work at the pool area is looking really strong right now! The pots are fantastic and the Crape Myrtles are blooming in all their glory! Roses are doing well and the grasses are beginning to set off their nice display. I also hear the Pergola is a smash hit as well! Trees always win the battle for wate when competing woth turf. 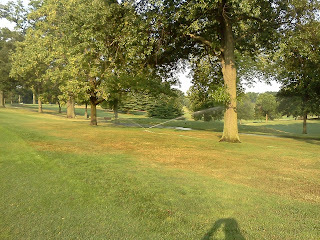 Even though we have a newer irrigation system, turf cannot out compete trees without rain. In this case, we are running a portable sprinkler to give this area of the rough along # 4 fwy and 5 tee a chance to stay alive. This is a high cart area as you know. A couple of hour soaking should be enough to keep the area alive until it rains. We limit the use of these portables to areas that are high traffic and play areas. And additional spot is the rough along 12 & 3which is full of trees and lacks the correct amount of water.